The recipe is courtesy of Sainsbury’s magazine (supermarket magazines are the best place to find clever recipes in my opinion). Here are a few tips for super-charging salad, also courtesy of Sainsbury’s: ‘liven it up with flaked salmon or sliced chicken; bulk it out with drained, canned beans; add roasted tomatoes, courgettes or cooked grains such as quinoa or pearl barley, to create more interesting textures and flavours; sprinkle toasted seeds or nuts on top for added crunch’. 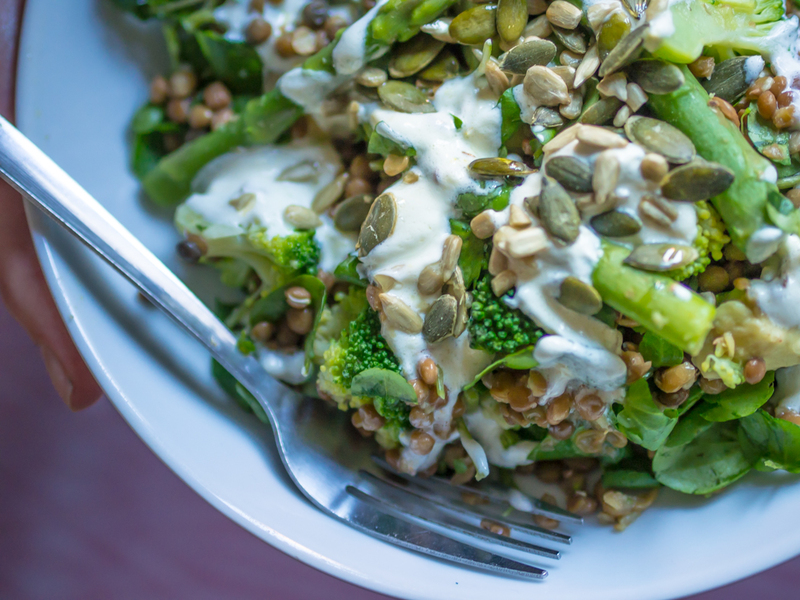 Make the dressing: combine the olive oil, cumin, garlic, lemon zest and juice and natural yoghurt. Set aside. Steam/boil the broccoli until just tender, adding the asparagus for the final 2 minutes. 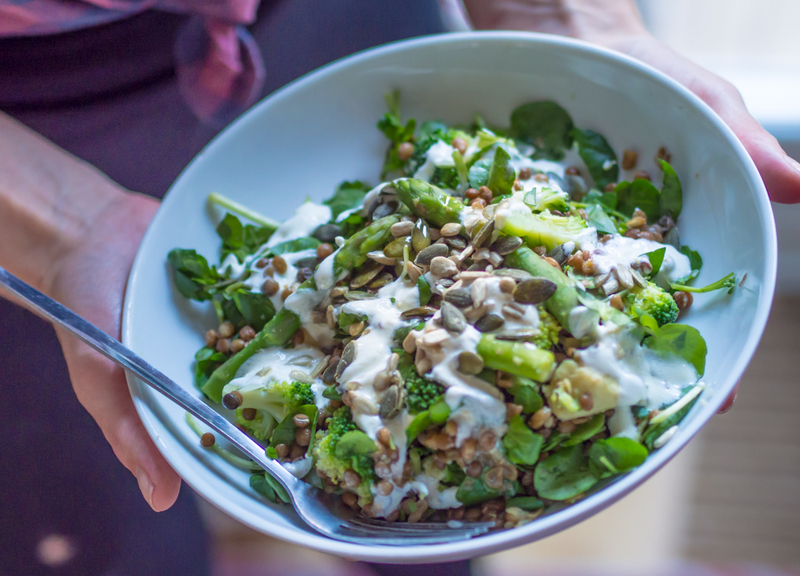 Toss together the salad leaves with the asparagus, broccoli, lentils and avocado. Divide between 4 plates and drizzle with the dressing and serve scattered with the seeds. LA-style all green salad look so healthy and delicious. Knowing that it serves and served just in 15 minutes. Must a try. Thank you for posting this wonderful recipe. I had made it once before and then forgotten where I’d got it from. I’d be grateful if you could let me know which month the sainsbury’s magazine was as I like to have the calorific values they supply with their recipes and there were other recipes in that issue that appealed. Keep up the good work… love your choice of recipes. Never mind, thanks for replying. Making your Mediterranean Fish Stew next! Kath.